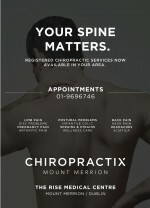 CHIROPRACTIX has recently opened our newest clinic at The Rise Medical Centre, Mount Merrion. We offer a high quality, professional Chiropractic care that people can trust and rely on. We offer treatment of Joints, Muscles and the Spine with some of the complaints that we see most often being: Lower back Pain, Neck Pain, Disc Problems, Nerve Pain, Headaches, Sciatica, Pregnancy Pain and Sports injuries. As well as the care we provide inhouse in our clinic’s, we also like to get involved with the local communities by providing Information Stands, Health Talks and creating referral systems with groups, colleges and businesses. 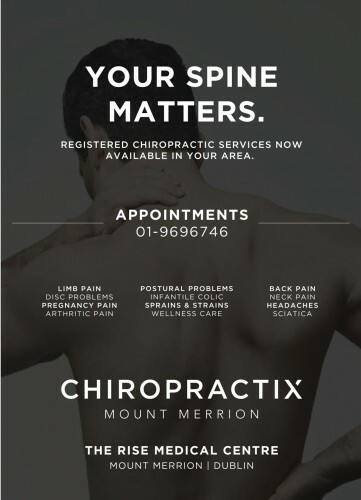 If anyone is interested in finding out more, please contact hello@chiropractix.ie.